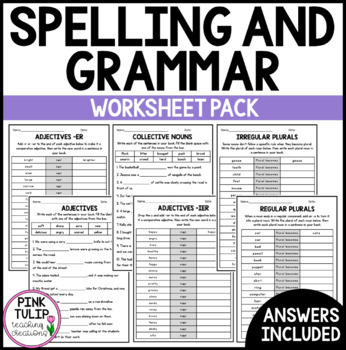 This 30 page English worksheet pack has been designed to help you teach grammar and spelling in your classroom. 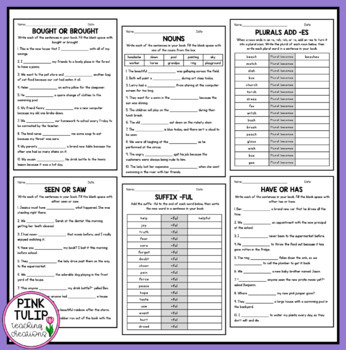 It includes an assortment of worksheets covering various English concepts, with a simple but effective layout. 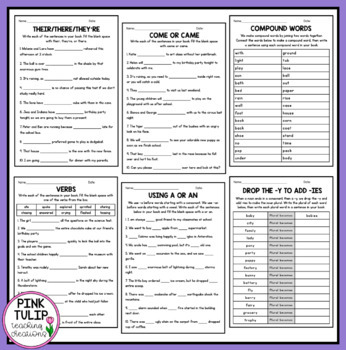 Students are encouraged to write the sentences for each worksheet in their books to support handwriting and sentence formation, as well as reinforce the learning concept. 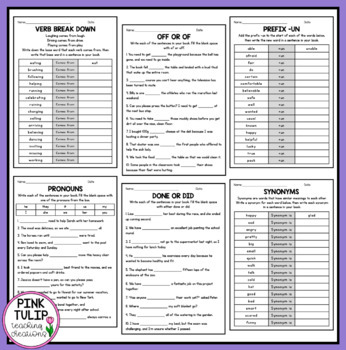 These are perfect for autonomous learners, print out one booklet for each student (can be printed 2 per page to save on copying and paper, then have students work through the booklet at their own pace during allocated English or grammar time. Encourage students to write the title of the worksheet they are completing at the top of their page, then ensure they are writing complete sentences to achieve optimal learning. Worksheets are aimed to line up with a grade 3/4 level. - Regular plurals (add an s). - Regular plurals (add an es). Answers are included for each worksheet. Click the green star at the top of my page to be the first to receive updates about new products and discounts. Please help me to improve my products by leaving valuable feedback. Simply click the 'Provide Feedback' button on your purchases page and leave a rating and a comment. You will also gain credits to use for further purchases. This product is not for commercial use, individual use only. If you plan to share this product with others, please purchase extra licenses at the 50% discounted rate.